All below explanation and samples are done by reading the document provided by the oracle coherence. The simplest and most flexible way to create caches in Coherence is to use the cache configuration descriptor to define attributes and names for your application's or cluster's caches, and to instantiate the caches in your application code referring to them by name that matches the names or patterns as defined in the descriptor. This approach to configuring and using Coherence caches has a number of very important benefits. It separates the cache initialization and access logic for the cache in your application from its attributes and characteristics. 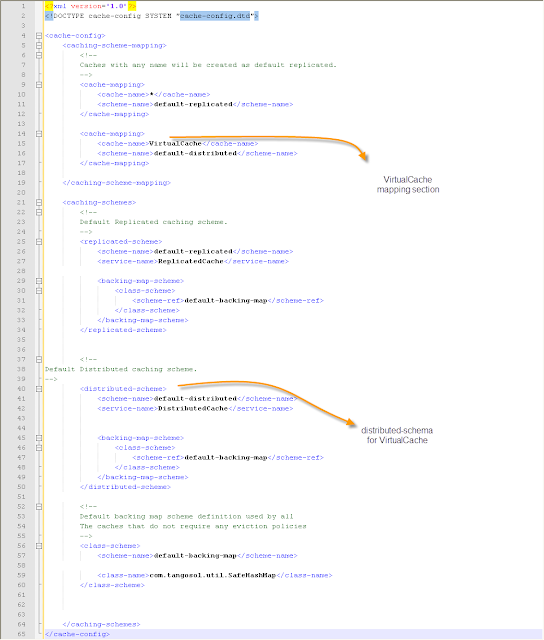 This way your code is written in a way that is independent of the cache type that will be utilized in your application deployment and changing the characteristics of each cache (such as cache type, cache eviction policy, and cache type-specific attributes, etc.) can be done without making any changes to the code whatsoever. It allows you to create multiple configurations for the same set of named caches and to instruct your application to use the appropriate configuration at deployment time by specifying the descriptor to use in the java command line when the node JVM is started. 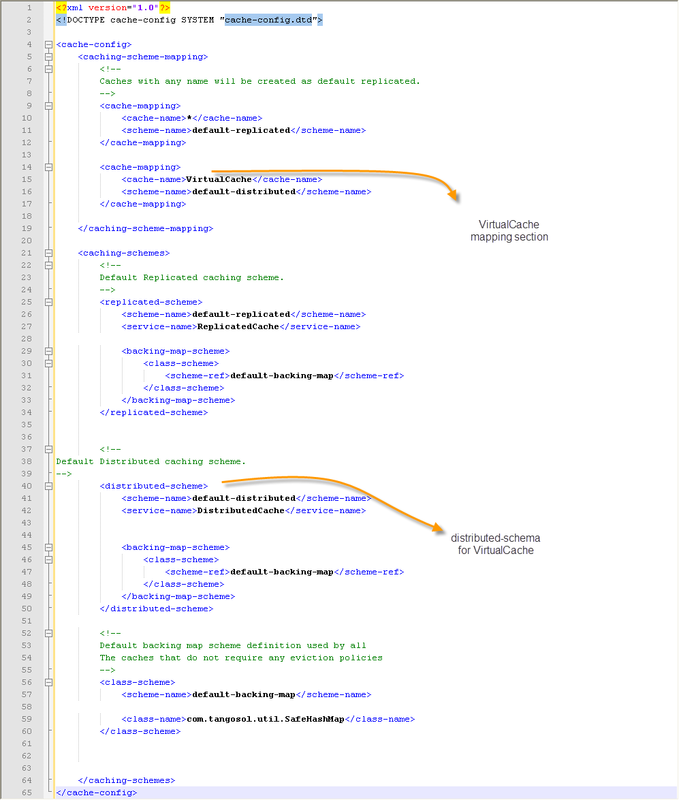 coherence config will have two primary sections caching-schemessection and caching-scheme-mapping section. The caching-schemessection is where the attributes of a cache or a set of caches get defined. The caching schemes can be of a number of types, each with its own set of attributes. 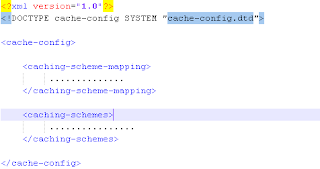 The caching schemes can be defined completely from scratch, or can incorporate attributes of other existing caching schemes, referring to them by their scheme-names(using ascheme-ref element) and optionally overriding some of their attributes to create new caching schemes. This flexibility enables you to create caching scheme structures that are easy to maintain, foster reuse and are very flexible. The caching-scheme-mapping section is where the specific cache name or a naming pattern is attached to the cache scheme that defines the cache configuration to use for the cache that matches the name or the naming pattern. sample configuration and war file download from below code.